O’Grady’s Landscape designs and installs custom walkways and pathways for residential landscapes in Great Falls, VA. Whether you are looking to improve safety in your property or want to create added charm and visual appeal, we can provide you with a walkway design tailored to your vision and the surrounding landscape. Our pathways are carefully crafted on a project-by-project basis, allowing you full control over the finished result. With a custom walkway by O’Grady’s Landscape, you can guide visitors through your landscape in style. Request your consultation today or call (703) 533-5001 to learn more about our Great Falls, VA walkway services! Stones are available in various shapes, sizes, and colors to meet your needs. Your walkway can also be designed in either a structured style or a random, irregular pattern. Material options for paver walkway projects in Great Falls, VA include concrete, brick, and natural stone pavers. Our landscapers can help you with your selection based on your requirements for budget and functionality, as well as the placement of your walkway and your aesthetic preferences. 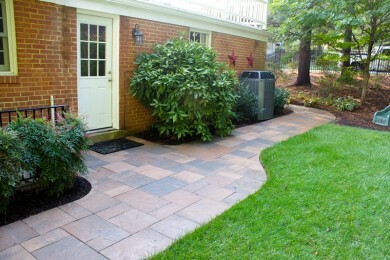 Our pathways in Great Falls, VA tend to offer a more natural, inviting look than our more structured walkways. Boulders or larger stones can provide added direction alongside one-of-a-kind beauty, whether wrapped around a garden or a koi pond. Choose to stack stones on top of each other to create unique visual interest or opt for steppers that can lead your guests from one part of your landscape to another. We invite you to view photos of both methods within our pathway gallery, where you’ll also find a display of flagstone and paver patios to complement your walkways. At O’Grady’s Landscape, we specialize in hardscape design services for homes throughout Great Falls, VA. Our custom pathways and walkways are built to withstand heavy traffic and snowy weather without compromising on beauty to achieve this level of functionality. We have been building custom walkways for homes all over Great Falls, VA since 1991 and know what it takes to create the best designs. Let us put our experience to work for you. Request your consultation online or call (703) 533-5001 for your free estimate!